As we welcome a new year, we are getting ready for a new issue. But before we do, we say goodbye to our third issue “Coming of Age” with some of the pics of the last bunch of boys we featured. 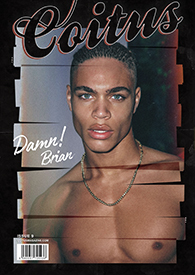 Tom Landers, Chris Wetmore, Ben Somers, Alex Annand, Elliot Joseph Rentz, Marlon Courbin, Markus Nilsson and Panos Malactos photographed by Pantelis and styled by Ben Schofield complete the issue that features 21 models and that have all now appeared on our online blog. For a lot more photos of these and the rest of the boys make sure you get some of the last few copies of issue 3 remaining as its heading towards being another sell out – collector’s issue.